Apply problem-solving techniques to solve for quantities in more complex systems of forces. Integrate concepts from kinematics to solve problems using Newton’s laws of motion. There are many interesting applications of Newton’s laws of motion, a few more of which are presented in this section. These serve also to illustrate some further subtleties of physics and to help build problem-solving skills. Suppose two tugboats push on a barge at different angles, as shown in Figure 1. The first tugboat exerts a force of in the x-direction, and the second tugboat exerts a force of in the y-direction. Figure 1. (a) A view from above of two tugboats pushing on a barge. (b) The free-body diagram for the ship contains only forces acting in the plane of the water. It omits the two vertical forces—the weight of the barge and the buoyant force of the water supporting it cancel and are not shown. Since the applied forces are perpendicular, the x- and y-axes are in the same direction as Fx and Fy. The problem quickly becomes a one-dimensional problem along the direction of Fapp, since friction is in the direction opposite to Fapp. The direction of has already been determined to be in the direction opposite to or at an angle of south of west. The numbers used in this example are reasonable for a moderately large barge. It is certainly difficult to obtain larger accelerations with tugboats, and small speeds are desirable to avoid running the barge into the docks. Drag is relatively small for a well-designed hull at low speeds, consistent with the answer to this example, where is less than 1/600th of the weight of the ship. In the earlier example of a tightrope walker we noted that the tensions in wires supporting a mass were equal only because the angles on either side were equal. Consider the following example, where the angles are not equal; slightly more trigonometry is involved. 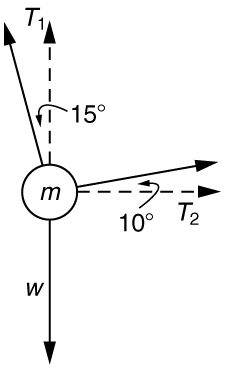 Consider the traffic light (mass 15.0 kg) suspended from two wires as shown in Figure 2. Find the tension in each wire, neglecting the masses of the wires. Figure 2. A traffic light is suspended from two wires. (b) Some of the forces involved. (c) Only forces acting on the system are shown here. The free-body diagram for the traffic light is also shown. (d) The forces projected onto vertical (y) and horizontal (x) axes. The horizontal components of the tensions must cancel, and the sum of the vertical components of the tensions must equal the weight of the traffic light. 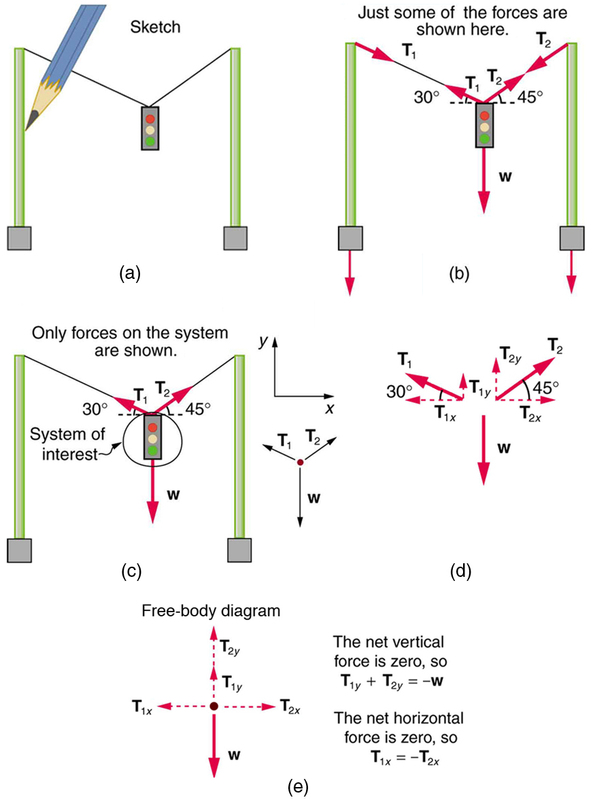 (e) The free-body diagram shows the vertical and horizontal forces acting on the traffic light. The system of interest is the traffic light, and its free-body diagram is shown in Figure 2(c). The three forces involved are not parallel, and so they must be projected onto a coordinate system. The most convenient coordinate system has one axis vertical and one horizontal, and the vector projections on it are shown in part (d) of the figure. There are two unknowns in this problem ( and ), so two equations are needed to find them. These two equations come from applying Newton’s second law along the vertical and horizontal axes, noting that the net external force is zero along each axis because acceleration is zero. Both tensions would be larger if both wires were more horizontal, and they will be equal if and only if the angles on either side are the same (as they were in the earlier example of a tightrope walker). The bathroom scale is an excellent example of a normal force acting on a body. It provides a quantitative reading of how much it must push upward to support the weight of an object. But can you predict what you would see on the dial of a bathroom scale if you stood on it during an elevator ride? Will you see a value greater than your weight when the elevator starts up? What about when the elevator moves upward at a constant speed: will the scale still read more than your weight at rest? Consider the following example. Example 3: What Does the Bathroom Scale Read in an Elevator? Figure 3 shows a 75.0-kg man (weight of about 165 lb) standing on a bathroom scale in an elevator. Calculate the scale reading: (a) if the elevator accelerates upward at a rate of , and (b) if the elevator moves upward at a constant speed of 1 m/s. Figure 3. (a) The various forces acting when a person stands on a bathroom scale in an elevator. The arrows are approximately correct for when the elevator is accelerating upward—broken arrows represent forces too large to be drawn to scale. T is the tension in the supporting cable, w is the weight of the person, ws is the weight of the scale, weis the weight of the elevator, Fs is the force of the scale on the person, Fp is the force of the person on the scale, Ft is the force of the scale on the floor of the elevator, and N is the force of the floor upward on the scale. 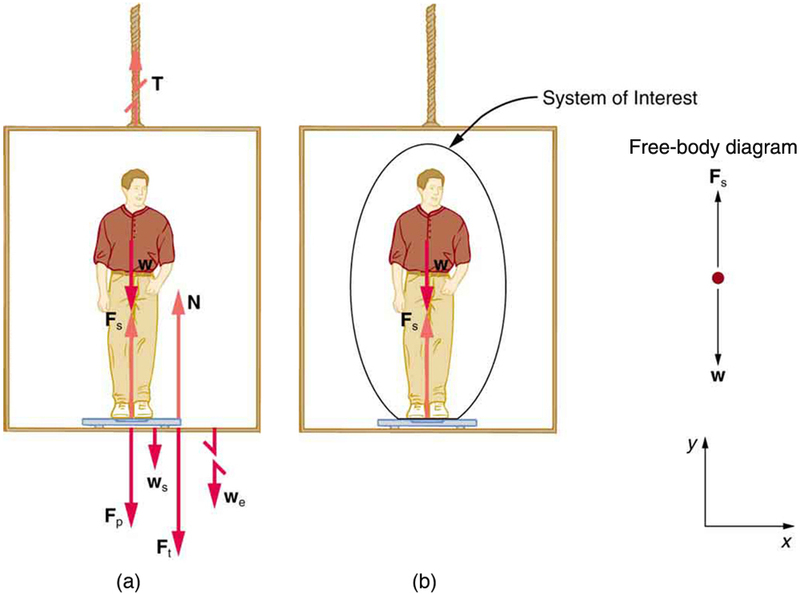 (b) The free-body diagram shows only the external forces acting on the designated system of interest—the person. No assumptions were made about the acceleration, and so this solution should be valid for a variety of accelerations in addition to the ones in this exercise. So, the scale reading in the elevator is greater than his 735-N (165 lb) weight. This means that the scale is pushing up on the person with a force greater than his weight, as it must in order to accelerate him upward. Clearly, the greater the acceleration of the elevator, the greater the scale reading, consistent with what you feel in rapidly accelerating versus slowly accelerating elevators. The scale reading is 735 N, which equals the person’s weight. This will be the case whenever the elevator has a constant velocity—moving up, moving down, or stationary. The solution to the previous example also applies to an elevator accelerating downward, as mentioned. When an elevator accelerates downward, is negative, and the scale reading is less than the weight of the person, until a constant downward velocity is reached, at which time the scale reading again becomes equal to the person’s weight. If the elevator is in free-fall and accelerating downward at then the scale reading will be zero and the person will appear to be weightless. Step 1. Identify which physical principles are involved. Listing the givens and the quantities to be calculated will allow you to identify the principles involved. Step 2. Solve the problem using strategies outlined in the text. If these are available for the specific topic, you should refer to them. You should also refer to the sections of the text that deal with a particular topic. The following worked example illustrates how these strategies are applied to an integrated concept problem. Example 4: What Force Must a Soccer Player Exert to Reach Top Speed? A soccer player starts from rest and accelerates forward, reaching a velocity of 8.00 m/s in 2.50 s. (a) What was his average acceleration? (b) What average force did he exert backward on the ground to achieve this acceleration? The player’s mass is 70.0 kg, and air resistance is negligible. To solve an integrated concept problem, we must first identify the physical principles involved and identify the chapters in which they are found. Part (a) of this example considers acceleration along a straight line. This is a topic of kinematics. Part (b) deals with force, a topic of dynamics found in this chapter. The following solutions to each part of the example illustrate how the specific problem-solving strategies are applied. These involve identifying knowns and unknowns, checking to see if the answer is reasonable, and so forth. This is an attainable acceleration for an athlete in good condition. This is about 50 pounds, a reasonable average force. This worked example illustrates how to apply problem-solving strategies to situations that include topics from different chapters. The first step is to identify the physical principles involved in the problem. The second step is to solve for the unknown using familiar problem-solving strategies. These strategies are found throughout the text, and many worked examples show how to use them for single topics. You will find these techniques for integrated concept problems useful in applications of physics outside of a physics course, such as in your profession, in other science disciplines, and in everyday life. The following problems will build your skills in the broad application of physical principles. Newton’s laws of motion can be applied in numerous situations to solve problems of motion. The normal force on an object is not always equal in magnitude to the weight of the object. If an object is accelerating, the normal force will be less than or greater than the weight of the object. Also, if the object is on an inclined plane, the normal force will always be less than the full weight of the object. Some problems will contain various physical quantities, such as forces, acceleration, velocity, or position. You can apply concepts from kinematics and dynamics in order to solve these problems of motion. 1: To simulate the apparent weightlessness of space orbit, astronauts are trained in the hold of a cargo aircraft that is accelerating downward at Why will they appear to be weightless, as measured by standing on a bathroom scale, in this accelerated frame of reference? Is there any difference between their apparent weightlessness in orbit and in the aircraft? 2: A cartoon shows the toupee coming off the head of an elevator passenger when the elevator rapidly stops during an upward ride. Can this really happen without the person being tied to the floor of the elevator? Explain your answer. 1: A flea jumps by exerting a force of straight down on the ground. A breeze blowing on the flea parallel to the ground exerts a force of on the flea. Find the direction and magnitude of the acceleration of the flea if its mass is Do not neglect the gravitational force. 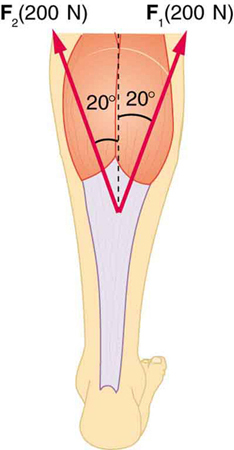 2: Two muscles in the back of the leg pull upward on the Achilles tendon, as shown in Figure 4. (These muscles are called the medial and lateral heads of the gastrocnemius muscle.) Find the magnitude and direction of the total force on the Achilles tendon. What type of movement could be caused by this force? 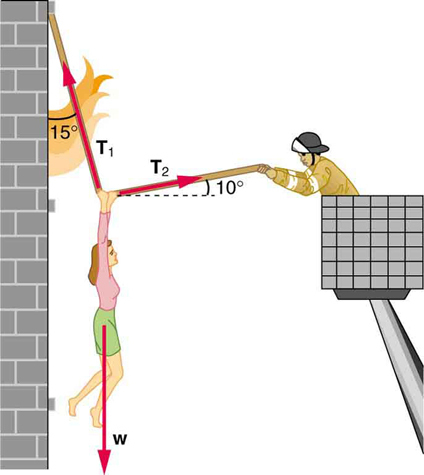 3: A 76.0-kg person is being pulled away from a burning building as shown in Figure 5. Calculate the tension in the two ropes if the person is momentarily motionless. Include a free-body diagram in your solution. 5: Integrated Concepts When starting a foot race, a 70.0-kg sprinter exerts an average force of 650 N backward on the ground for 0.800 s. (a) What is his final speed? (b) How far does he travel? 6: Integrated Concepts A large rocket has a mass of at takeoff, and its engines produce a thrust of (a) Find its initial acceleration if it takes off vertically. (b) How long does it take to reach a velocity of 120 km/h straight up, assuming constant mass and thrust? (c) In reality, the mass of a rocket decreases significantly as its fuel is consumed. Describe qualitatively how this affects the acceleration and time for this motion. 7: Integrated Concepts A basketball player jumps straight up for a ball. To do this, he lowers his body 0.300 m and then accelerates through this distance by forcefully straightening his legs. This player leaves the floor with a vertical velocity sufficient to carry him 0.900 m above the floor. (a) Calculate his velocity when he leaves the floor. (b) Calculate his acceleration while he is straightening his legs. He goes from zero to the velocity found in part (a) in a distance of 0.300 m. (c) Calculate the force he exerts on the floor to do this, given that his mass is 110 kg. 8: Integrated Concepts A 2.50-kg fireworks shell is fired straight up from a mortar and reaches a height of 110 m. (a) Neglecting air resistance (a poor assumption, but we will make it for this example), calculate the shell’s velocity when it leaves the mortar. (b) The mortar itself is a tube 0.450 m long. Calculate the average acceleration of the shell in the tube as it goes from zero to the velocity found in (a). (c) What is the average force on the shell in the mortar? Express your answer in newtons and as a ratio to the weight of the shell. 9: Integrated Concepts Repeat Exercise 8 for a shell fired at an angle from the vertical. 10: Integrated Concepts An elevator filled with passengers has a mass of 1700 kg. (a) The elevator accelerates upward from rest at a rate of for 1.50 s. Calculate the tension in the cable supporting the elevator. (b) The elevator continues upward at constant velocity for 8.50 s. What is the tension in the cable during this time? (c) The elevator decelerates at a rate of for 3.00 s. What is the tension in the cable during deceleration? (d) How high has the elevator moved above its original starting point, and what is its final velocity? 11: Unreasonable Results (a) What is the final velocity of a car originally traveling at 50.0 km/h that decelerates at a rate of for 50.0 s? (b) What is unreasonable about the result? (c) Which premise is unreasonable, or which premises are inconsistent? 12: Unreasonable Results A 75.0-kg man stands on a bathroom scale in an elevator that accelerates from rest to 30.0 m/s in 2.00 s. (a) Calculate the scale reading in newtons and compare it with his weight. (The scale exerts an upward force on him equal to its reading.) (b) What is unreasonable about the result? (c) Which premise is unreasonable, or which premises are inconsistent? (c) The average force is 252 times the shell’s weight. 4.7 Further Applications of Newton’s Laws of Motion by OpenStax is licensed under a Creative Commons Attribution 4.0 International License, except where otherwise noted.